Caption: Ms Mr Taher Shams, Managing Director at Zulekha Hospitals, released the GRI report with Ms Habiba Al Marashi, President and CEO, Arabia CSR Network and Dr. Zulekha Daud, Chairperson of Zulekha Hospitals. 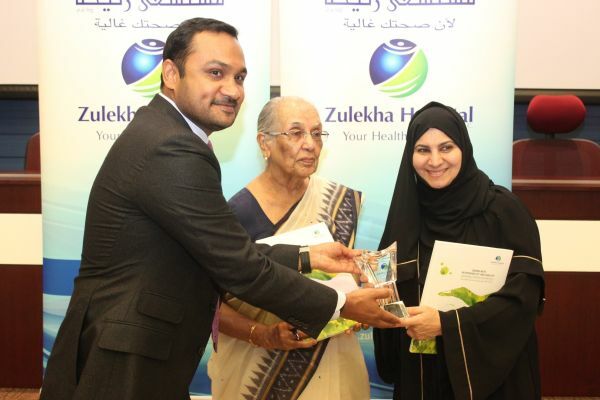 Zulekha Hospitals has released its second sustainability report detailing the organisation’s financial and operational undertakings in accordance with global corporate governance standards. The report was officially released by Ms Habiba Al Marashi, President and CEO, Arabia CSR Network in the auditorium of Zulekha Hospital in Sharjah today (5 April). The launch follows the Global Reporting Initiative’s (GRI) G4 Guidelines, designed to encourage integration of CSR programs into organisations’ development strategies. GRI, a global non-profit body promoting sustainability in business, published its set of guidelines in 2013 to provide exclusive global comparability standards for companies striving for greater transparency on environmental, social and governance disclosure. During her opening speech, Ms Al Marashi commended Zulekha Hospitals for its continuous effort to prioritising and engaging with its stakeholders in a meaningful manner. “Transparency and accountability are pivotal in today’s complex world in building trust, confidence and long term reputation, all being elements that are imperative for a business’ long term success and continuous sustainability,” she said. By placing an even greater emphasis on their drive for sustainability, Zulekha Hospitals’ extensive GRI report, themed “Caring with Responsibility and Quality”, provides comprehensive strategic disclosures on their economic, environmental, and social impact of its governance between 2014 and 2015. The report, comprising 12 sections outlining different areas of the organisation’s governance such as the assessment of quality management, awards, supply chain management, patients as well as staff welfare control, shows that the hospital’s employee satisfaction scores increased by 6% in 2015, the sixth consecutive rise in as many years. Mr Taher Shams, Managing Director of Zulekha Hospitals, believes that adhering to international standards as those set by G4 Guidelines is the only way forward for organisations striving to enhance their sustainable business practices. He said: “Having defined principles of corporate governance that follow global sustainability criteria are at the core of Zulekha Hospitals’ business strategy. In the past decade, Zulekha Hospitals has received 18 awards for its commitment towards quality care and sustainable business practises, including Joint Commission International Accreditation for patient care and safety, and College of American Pathologists Accreditation for pathology and laboratory medicine standards. It also received the Best Sustainable Hospital Award at the Hospital Build & Infrastructure Awards, and the Dubai Quality Award for its commitment to quality service and business excellence.